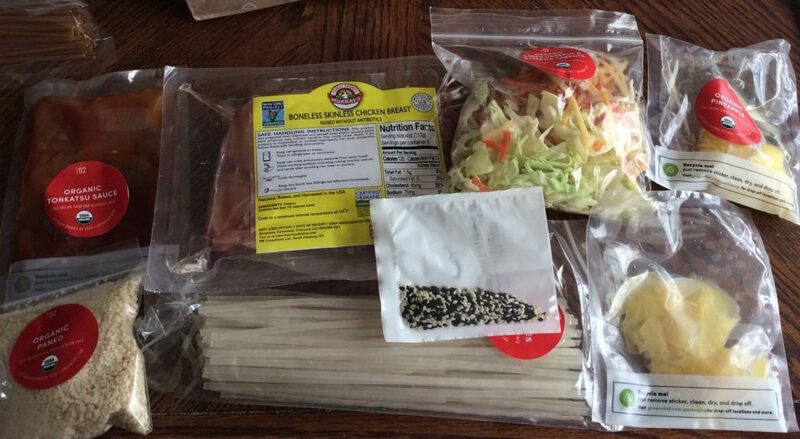 I’m getting bored writing reviews of meal kits, but I want to at least finish this project. After trying Green Chef this week, I only have one more meal kit company to try (Marley Spoon), and then I’ll be ready to give my final verdict as to which is the best Meal Kit company. But I’ll give you a hint: it’s not Green Chef. You’ll have to wait until my review of the company to hear why, however. 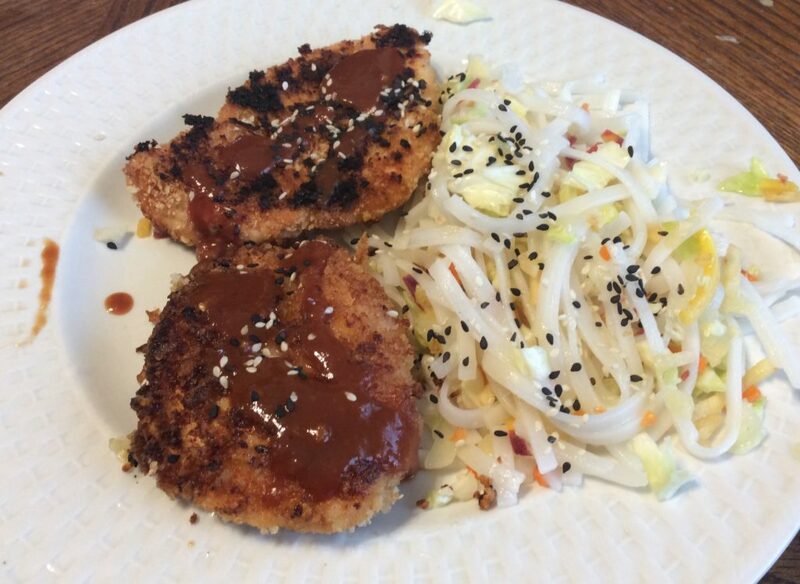 I made the Chicken Katsu Noodle salad with cabbage, carrots, pineapple & pickled ginger tonight and shared it with my daughter. We weren’t particularly impressed. First, as the cook, I really resented all the needless preparation. The cabbage, pineapple and pickled ginger had already been processed and cut into strips or cubed – and yet I was told to chop them. Why not go all the way and send them chopped? Most annoyingly, the instructions asked that I cut the chicken breasts horizontally into two thin cutlets. That’s the sort of task that requires sharp knives and knife skills. I did a fairly good job of it, but it shouldn’t be left to the home cook to do this preparation. I did enjoy the chicken, however. The chicken cutlets were dipped in tonkatsu sauce, breaded with panko crumbs, sauteed on both sides for 3 minutes and then cooked in the oven for 6 more. I really would like to know why I couldn’t just finish the whole thing on the stove (I hate having to preheat the oven), so Green Chef fails for not explaining this. But my daughter really liked the chicken and it looks like the sauce is available commercially and it’s also fairly easy to make. The noodle salad, OTOH, was a disappointment. It lacked flavor and none of us liked it. I also wasn’t thrilled that the meal didn’t have any exotic ingredients. At this price point, I expect it to include things I can’t easily get at my supermarket. In all fairness, it did have some very cool looking black & white sesame seeds – but that was just for show – and it did include pickled ginger in the salad, but the salad sucked. This meal kit had 580 calories per serving. It was on the small side and I was left hungry (but then again, I didn’t want to eat the salad). The regular price for this meal kit is ~$26. I paid $10 with a discount, and really, I wouldn’t pay more than that.